The healthiest churches are relentless about being effective, not just busy. They do this by following the Closet Rule. It’s not easy to create a culture of renewal, change and adaptability in an existing small church. There needs to be a renewal process in place or the changes will be random, unsettling and ultimately, unsuccessful. We'll end up work harder without working smarter. The healthiest churches are relentless about being effective, not just busy. They trim off anything that saps time and energy. They refuse to be burdened by clutter. They do this by following the Closet Rule. What Is the Closet Rule? When people have to live in small spaces, de-cluttering experts tell them this: before you add a new item of clothes to your closet, toss out an old one. Small churches need to do the same thing. This is the Closet Rule for small churches: Don’t add a new ministry until you’re willing to lose an old ministry. The Closet Rule for small churches: Don’t add a new ministry until you’re willing to lose an old ministry. We love having new things, but we hate change. So we add new things without removing old things. This leads to clutter. Physical, emotional and spiritual clutter. I was guilty of this for many years. I would get a new ministry idea from a church leadership seminar or new book. But when I presented it to the church, I’d get blank stares. It wasn’t because the church was filled with heel-draggers and vision-killers. It’s because what I saw as an exciting new ministry opportunity, they saw as one more thing to add to their full calendar. The Closet Rule forces us to prioritize. To think before acting. It helps us enact changes according to a logical process, not on a momentary whim. Imagine the ministries of a too-busy church as a cluttered closet. We all have those clothes in the center of the closet that we like and wear regularly. But we also have clothes that make their way to the back and sides – and they stay there. They haven’t been worn in years. But we can’t bring ourselves to toss them even though they cost us valuable space. Church ministries are the same. Many small church pastors feel like we're accomplishing very little, even though we're constantly busy, because we're trying to do too much. Any church that's been around for a while has long-standing ministries that are loved and used all the time. They’re front-and-center. But we also have ministries that have not aged well. They’ve stopped working, but they still cost precious time and energy. They’ve been shoved to the side, but they still take up valuable space. And time. And money. And no, I’m not talking about ministries that may have just a few people in them. Size has nothing to do with the value of a ministry. It’s about effectiveness. Size has nothing to do with the value of a ministry. It’s about effectiveness. 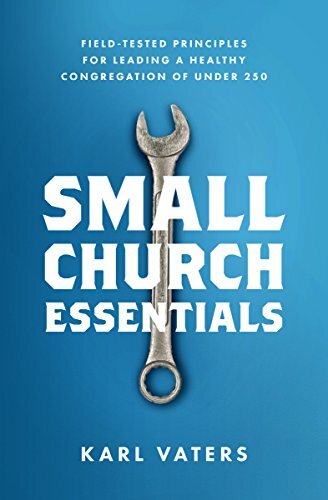 Healthy small churches relentlessly monitor their schedules to reduce ministry clutter. And the healthiest ones start reducing clutter, not after they find a great new idea, but before. We need to clear space in the closet first. Only then will we be ready to add something fresh and new. What ministries have ceased to be effective? What ministries cost more money, time or energy than they’re worth? If we were starting the church today, would we do this? What ministries don’t fit the mission or vision of the church? Can this ministry be refreshed, or should it be ended? What are we doing that we wish we didn’t have to do? Renew It, Replace It or Say Goodbye to It? 1. RENEW IT: Many ministries need a face-lift. Or an extreme makeover. If the foundation of the ministry is solid, it’s meeting a valid need and it has a core of leaders, it may need some TLC to get back on its feet again. 2. REPLACE IT: Some ministries need more than a makeover. They need to make way for something that works. Like replacing the stained, torn, ill-fitting blue shirt in the back of the closet with a new green shirt. 3. SAY GOODBYE TO IT: Some ministries are beyond repair. Their reason for being has ceased to exist. If it’s time to say goodbye to it, we need to make the brave choice to do that. In all three cases, the people who may still be going through the motions of the ministry deserve to be treated tenderly. Their needs should be heard and validated. If the ministry can be salvaged, we need to do whatever we can to involve them in the updating or replacement process. If the ministry must be ended, their contributions should be honored. People should never feel belittled in this process. But we must always remember this hard truth. Not wanting to hurt people’s feelings is never enough of a reason to keep doing an ineffective ministry. The Closet Rule is not always easy to implement. And it won’t happen overnight. But it, or something like it, must happen. Once you start it, this process becomes a part of the church DNA. People who used to resist change can learn to appreciate that church ministries must be assessed and renewed in order to be effective. After the initial shock of losing some ministries that people are emotionally invested in, most people will be grateful when they realize that their time and energy have greater impact now. Their efforts are being respected because they’re being effective. What they do, matters. How Does a Closet Grow? As a church gets healthier, it’s like getting a larger closet. Leadership training grows the closet, too. The same goes for devising more efficient systems, upgrading the facility and more. Anything that allows us to do more ministry without adding more burden to the leadership and congregation is like getting a larger closet. Ministries can become more effective without overburdening people’s wallets and schedules. When that happens, some new ministries can be added without old ones being lost. But that should be done carefully. Clutter has a mind of its own and we must always be wary of it. Renewing ministries is not about Old vs. New, or Big vs. Small. It’s about Effective vs. Ineffective. But, more than anything else, I hope you’ll remember this. Renewing ministries is not about Old vs. New, or Big vs. Small. It’s about Effective vs. Ineffective. In the battle for the hearts, minds and spirits of people, we must always be on the side of effectiveness. Copyright © 2016 by the author or Christianity Today/Leadership Journal. Click here to read our guidelines concerning reprint permissions.